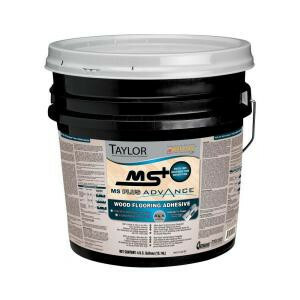 Taylor MS Plus Advance 4-gal. Superior performance adhesive with Meta-Tec Technology, is a one component 100% solids, solvent free, MS polymer-based adhesive formulated for the interior installation of all types of wood flooring including solid wood up to 3/4 in. and bamboo flooring over approved substrates. Eligible f or 10 year warranty for moisture reduction up to 10 lbs or 85% RH, and sound deadening to meet IIC and STC requirements, when applied with Taylor Glide-On trowel. It also provides for crack isolation for cracks up to 1/8 in. thick. Lifetime Warranty No Manufacturer Warranty 10 year for moisture and lifetime for bond.